After looking at many yards and speaking with other turf managers in the area, we found 2 common denominators. 1.Moisture - having seen zero lawns that are dry an unirrigated that have been attacked. That tells me that when the moths fly here from "down yonder" , they lay their eggs near areas where they see succulent, soft turf tissue in wet warm soil to feed on. Would you rather eat a piece of cardboard or a juicy steak? 2. Disease control - ALL yards that I have seen damaged so far, have been yards that had the healthiest turfgrass through late July. AKA, They had all been treated with disease control this summer and therefore had the healthiest foliage to feed on. Conclusions - having a crappy unirrigated lawn full of weeds almost completely eliminates the risk armyworms will do damage to your lawn. We have seen 1 case of armyworm damage in 37027. The other 11 were in 37215 or 37205. All lawns with damage have irrigation and at least 1 "overly wet" area in the lawns. My guess is these "overly wet areas" are irrigation leaks or poor drainage areas. My other guess is when the rains started coming in late July, most customers continued to irrigate on top of the rainfall. 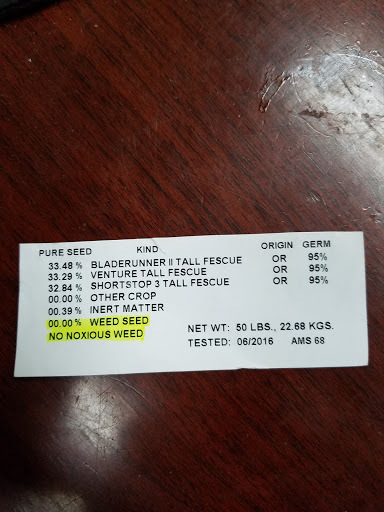 If you would like more information on this year's seed blend, click link.